Cookie bite or U-shaped audiograms. There are many patterns of hearing loss. Generally clinicians group them along several axes; sensory vs conductive; the severity axis -- mild vs moderate vs. profound; the time axis -- sudden vs progressive vs chronic, and the frequency spectrum that is affected. Roughly speaking, the frequency patterns of hearing loss are divided up into: Low-frequency, mid-frequency, high-frequency, notches, and flat. The "cookie bite" audiogram is a bilateral mid frequency notch. It is different from the "noise" notch which is generally centered at about 4K, because the "cookie bite" occurs at a lower frequency. There are also combinations of the above patterns -- mainly the "peaked", which is a mixture of low and high-frequency, sparing mid-frequency. Low frequency (Meniere's) -- also a low/high (peaked pattern) is common in Meniere's. 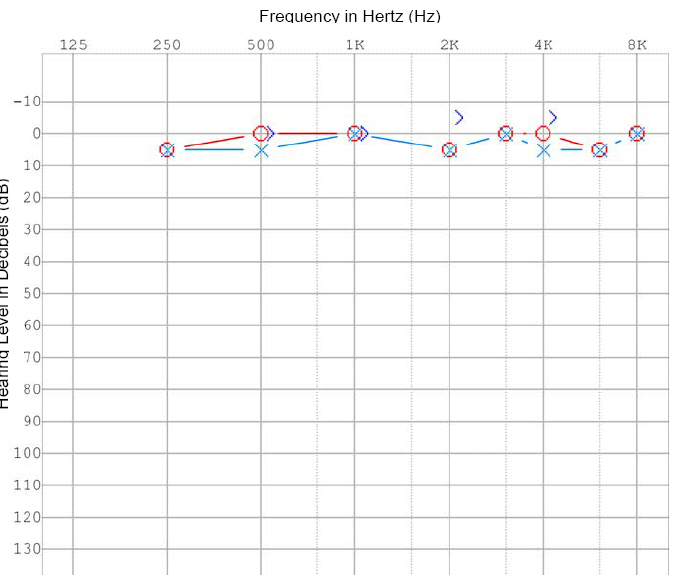 Middle frequency (or "cookie bite") centered on 1K High-frequency loss, beginning at 8K Flat hearing loss in both ears, R is worse. 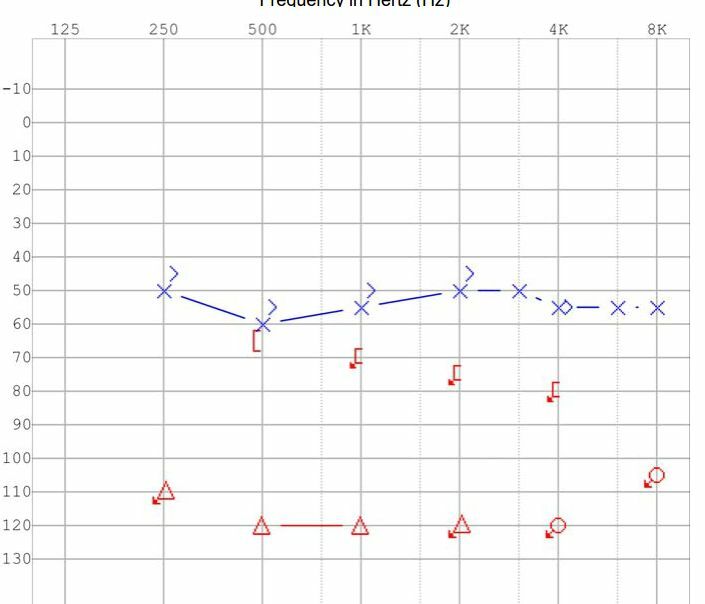 There are also occasional patients with a 2K notch, seen on the bone conduction audiogram, found in some patients with otosclerosis. 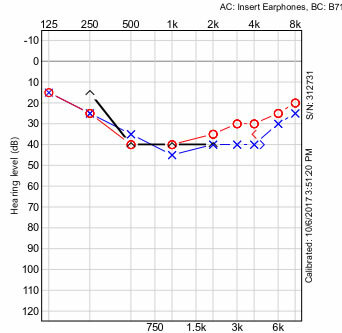 This notch in the bone conduction audiogram is attributed to the "resonance frequency of the middle ear". Here we are discussing only U-shaped or cookie bite patterns. As an overview, mid-frequency hearing loss is traditionally attributed to congenital hearing disorders(Wong & Bance, 2004) -- also see below. Cookie bites have also been described after carbon monoxide intoxication (Baker & Lilly, 1977), in patients with acoustic neuromas (Shah, Blevins, & Karmody, 2005). Lee et al (2017) reported on the "1000 Hz notch, and called it a "new clinical entity". We puzzle how it could be new given that there are papers going back to 1977 (at least). They defined this pattern as having a threshold 15 dB lower than 500 Hz, as well as 10 dB lower than 2K. The cookie bite audiogram above would not quite fit this, as it is only 10 dB lower than 500 Hz and 2K. Nevertheless, it seems to us that the "1K notch" could be just a mild cookie bite . Only one of their small group had it on both sides. We are not sure what to make of this paper. Is this just a group that is "splitting" out random hearing loss, or is it a mild and asymmetrical cookie bite ? Our impression is that "cookie bites" have been very little studied. In our own patients, "cookie bite" hearing loss is usually stable over decades, and often seem ignored by the patient. Cookie bites, in our population at least, are nearly always bilateral. Papers are easy to publish about genetic hearing loss conditions, so the literature is oversupplied with these. If there is a family history you should be thinking about this. Wong and Bance(2004) discussed causes of cookie bites including non-ocular Stickler’s syndrome(Admiraal, Brunner, Dijkstra, Huygen, & Cremers, 2000) and Waardenberg’s which are autosomal dominant. 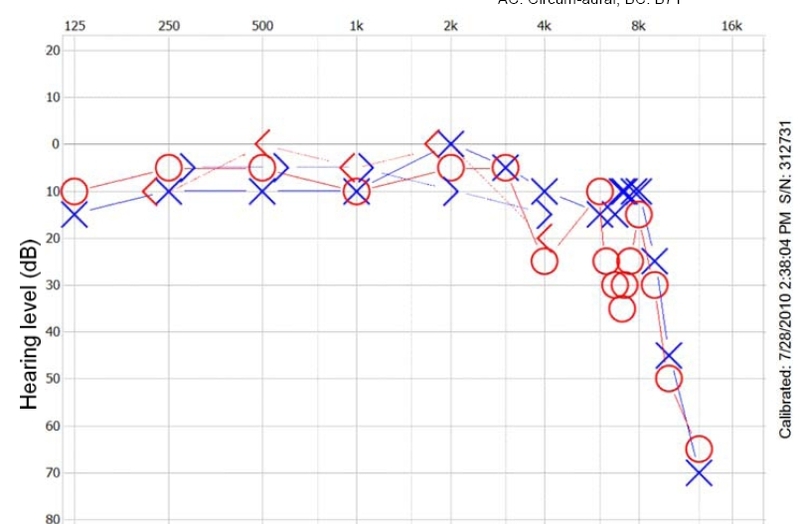 Also U shaped audiograms are occasionally seen in mutations of connexin 26 (autosomal recessive). Baker, S. R., & Lilly, D. J. (1977). Hearing loss from acute carbon monoxide intoxication. Ann Otol Rhinol Laryngol, 86(3 Pt 1), 323-328. Shah, R. K., Blevins, N. H., & Karmody, C. S. (2005). Mid-frequency sensorineural hearing loss: aetiology and prognosis. J Laryngol Otol, 119(7), 529-533. Wong, L., & Bance, M. (2004). Are all cookie-bite audiograms hereditary hearing loss? J Otolaryngol, 33(6), 390-392.